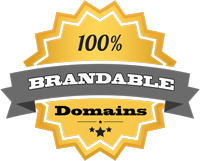 A great aspect of dictionary word domains is that you can employ a simple word in a new way as a brand. This name, Hare.tv, might be used as a video site for education, training, or entertainment; or use it to offer information on what your business offers. It could be a business unto itself, consisting perhaps of videos with ads, or a site supporting a brick-and-mortar business. TV domains are extremely versatile.